A set of drums consisting of generally 4 to 5 drums or more, and used in many different musical genres including jazz, rock, and funk. 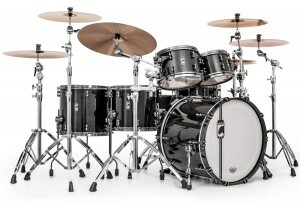 Common pieces of a drum setA set of drums consisting of generally 4 to 5 drums or more, and used in many different musical... include the snare drumOne of the more common drums in marching bands and drumlines and the primary drum of a drum set..., bass drumThe lowest pitched drum in a marching band or with a drum set. A two-headed drum, it is usually..., tom toms, and cymbals. The drums are arranged in a way which makes it easy for the drummer to strike all of them with their drumsticksA pair of wooden sticks used to play a drum or set of drums. Popular brands of drumsticks are P... without reaching far or shifting their body position.